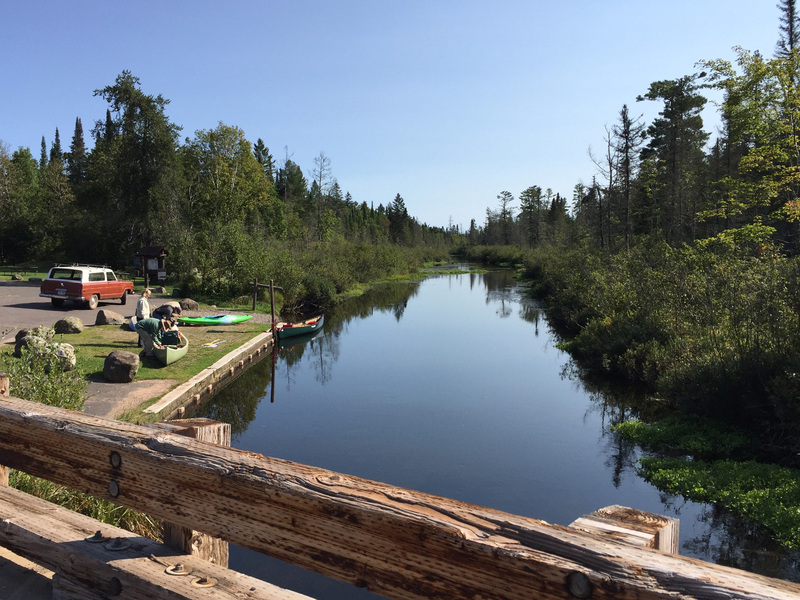 A premier paddling destination located in northern Wisconsin, the Bois Brule is a diverse river offering something for paddlers of every skill level. From flat water to lakes, riffles to exciting whitewater, all set in an idyllic northern Wisconsin backdrop, it’s a remarkable paddle that culminates on the sandy shores of Lake Superior. Add in that this historic 44 miles is protected and pristine, it’s no wonder that it’s a must-visit destination for midwest paddlers. Wisconsin Trail Guide provides a very useful chart that categorizes water levels for each section on the Brule. 125-200 is the lowest you’d be able to paddle (although, expect some scrapping at the low end). The levels we paddled at were great and gave us no notable difficulty at 145 cfs (and they stayed very consistent for the entire weekend). Time: Put in at 10:35a. Out at 2:50p. Wildlife: Ducks, trout (Brown and Brook), bald eagles, a heron, frogs and songbirds. For several years now we’ve had a Labor Day weekend tradition to camp and paddle with a group of friends, always a destination river outside our usual circumference, always an adventure, always a lot of fun. This year, we decided to cover the entirety of the Bois Brule River, a river that has been on our bucket list for quite awhile. Why? For one, it’s beautiful (crystal clear water, reliable levels, undeveloped banks, northwoods forest, rapids, ends in Lake Superior!, etc). For another, it has a lot of history and remarkable diversity. 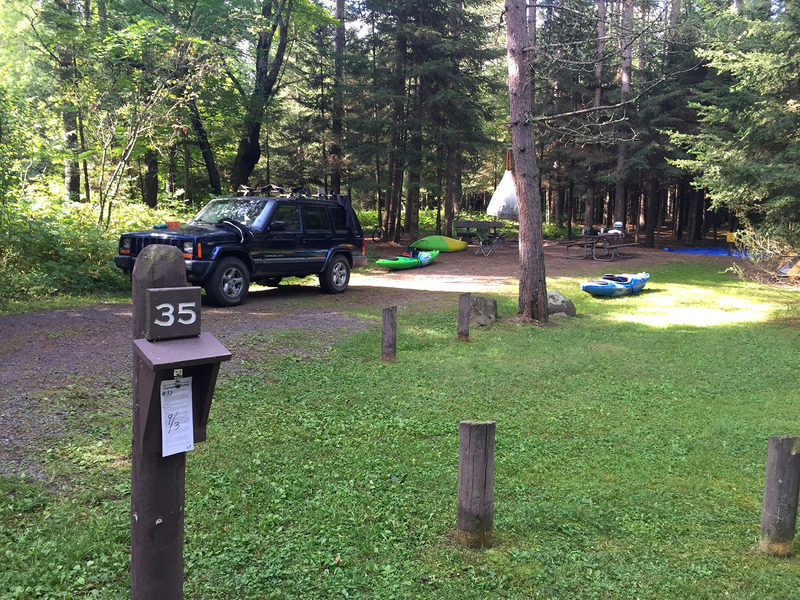 Furthermore, there are two public campgrounds right on the river itself, making for an almost luxurious ease of logistics (the Bois Brule Campground and Copper Range Campground – both require a State Park sticker. How to choose? 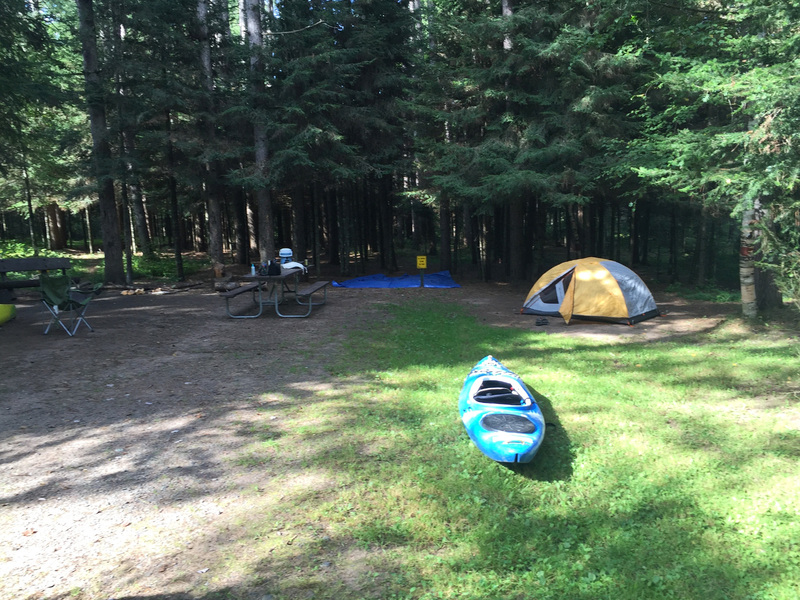 It really depends on which sections you plan on conquering – we chose the wonderful Copper Range Campground because we knew we were definitely paddling the last two sections at the very least). We could go on and on about the charm and charisma of the Bois Brule, but this would be like explaining to a football fanatic why the Packers matter. All things considered, the Bois Brule is a short river, approximately 50 miles long, but for all intents and purposes, only 38 miles are typically paddled. Given its spectacular popularity, locally and even nationally, that’s a lot of bang for your buck. Per paddling capita (we’re making that term up), we don’t think there’s another river as diverse as the Bois Brule, in Wisconsin at least. There’s just so much to see and experience in those 38 miles, and the river itself, together with its surrounding landscape, truly does go through a series of metamorphoses – from a sluggish conifer bog surrounded by soggy, spongy springs to light rapids, a couple lakes, more earnest rapids, 19th Century cedar estates and boathouses, woods, meadows, more woods, an ancient copper range with exciting Class II-III rapids, steep clay banks, and then finally a flat wetland complex leading to the largest freshwater lake on planet Earth. Much of this river has been well documented and covered in detail in many places (including Mike’s Svob’s, Paddling Northern Wisconsin) but our favorite source for the most recent information, complete with maps and an in-depth guide with turn-by-turn details is Wisconsin Trail Guide (formerly, Wisconsin Paddle Guide). The information is just really, really well done, and easy to follow. In fact, we followed it to the word, except for choosing the campgrounds as our put-ins and take-outs since we were camping at Copper Range (highly advisable for convenience and recommended, by the way). Dropping some 418 feet in 44 miles, (328 feet of that drop in the last 19 miles) the Bois Brule (often referred to as the Brule but not to be confused with the other Brule River in Northeastern Wisconsin which creates part of the boundary between upper Michigan and Wisconsin) offers a variety of distinct segments to choose from. There is literally something for everyone which is why its so popular. We’ll break down our experience and top-line the sections here but again, we suggest you dig into the details on Wisconsin Trail Guide, as they’ve been covered in user-friendly detail there. Stone’s Road Landing to Bois Brule Landing: A mixture of flat water, lakes, riffles and light rapids. This section is popular with fishermen and a great section for beginner paddlers. Bois Brule Landing to Copper Range Landing: This is the windiest section, almost completely flat water, but bookend by light riffles. This is another section popular with fishermen. Great for quite water enthusiasts. Copper Range Landing to Highway 13: The whitewater section. Constant riffles and class I rapids throughout. There are two sets of Class II(III) rapids known as “the ledges” that go by the name Lenroot and Mays (each are made up of four ledges unto themeselves). They were easy for us, but as bystanders, not-so-easy for others. Whitewater fans will love this trip. Highway 13 to Lake Superior: Very light but continuous riffles for most of the trip. There is one dam, the sea-lamprey barrier, that must be portaged. The portage is well-marked and not much of an inconvenience. From there, light riffles continue until the last mile of slack water which leads to Lake Superior. This section is great for beginners too. Being the river completists we are, we also wanted to paddle the obscure section of the river from its very source, as recently highlighted in the DNR’s Paddling Guide to State Natural Areas. So we also explored upstream of Stone’s Bridge landing but it’s not really a point-to-point destination – it was more of a there-and-back in our case. We’ll get to that later. In the meantime, we’re going to align our experience and reports on the Bois with those from Wisconsin Trail Guide. This is a really diverse section in its own right and almost acts as a summary of the following three. A popular fishing stretch, there’s plenty of flatwater and riffles but there are moments of fun, albeit brief, whitewater. It’s as easy a paddle as it is on the eyes. There’s a historic aspect to this trip that isn’t obvious from the river, even when you’re in the brief boundaries of Cedar Island (unless you had researched prior, you’d probably just think they were very nice cabins/boathouses). The Bois Brule is known as the River of Presidents, because for over a century it has been visited by U.S. presidents. As far back as the 1800s, Ulysses S. Grant and Grover Cleveland spent time at the Brule. Then, Coolidge spent an entire summer there at Cedar Island while in office (and apparently got pretty good at fly fishing). Eisenhower and even Herbert Hoover vacationed there (What? The Hoov? You bet). I could rehash the entire historic account of this stretch but others have done it better than I will (and I’ll try to prevent this report from being overly repetitive). Beth at Midwest Weekends has a great little history lesson and brief overview to check out here. There’s also a few other snippets of history that can be found here and here. The put-in at Stone’s Bridge Landing is excellent. There are facilities and fresh spring water running from a pipe (so Timothy tells me – I was suspect – considering the pipe). It’s a popular landing and was quite busy on this particularly beautiful Friday morning. Some paddlers were going there-and-back, some canoeing, some kayaking but most were getting a head start on trout fishing. This section starts as pretty, placid marsh with pine trees lining the banks. The water is crystal clear – marsh grasses, green and long, sway downstream – and sandy bottom alternated with rocky bottom to modest boulders lying just below the surface. It was slow, with almost no current, but that allowed time to gaze at the streambed below and look for trout (for which we spotted Brown and Brook throughout the day). It isn’t until after Rainbow Bend where the landscape starts to change, the river narrows a bit and hills appear in the periphery. Soon, you’ll come upon the Ordway boathouse, which is the start of the aforementioned Cedar Island estate. You’ll paddle through the property which is quite modest considering the wealthy politicians, businessmen and celebrities that once vacationed there. Its appearance is one of just pretty footbridges and well-kempt cottages. Soon after the estate, and beginning the alternating interruption of lake, river, lake, comes Falls Rapids, a really lively run. Scout Falls from the left bank. It’s a broad sweeping left curve and it’s swift and narrow which might take the unsuspecting by surprise. It’s rated a class I-II but to be honest, all classes at these levels felt on the low end (so a II felt like a I – they all felt easy and doable at these levels). Next come a series of lake sections that are essentially separated or “crimped” by other light-whitewater sections. A highlight of which comes just after the smaller Sucker Lake. It’s called Little Twin rapids and it’s a completely unique run where at the end, you’re literally spit out into a crystal clear lake by a wave of riffles. It’s something I’ve never experienced before and it was simply awesome. The riffles immediately gave way to flat water – almost like someone shut off the faucet while drawing a very large bath. And that might be a pretty accurate description because Big Lake is just that… Big – and a bit of a slog. But it’s pretty, with some scattered boulders, and more of that crystal clear water. Really, it’s the perfect time to just relax on a shallow lake while enjoying the broadest body of water you’ll encounter the rest of the trip (well, save for that tiny matter of the Great Lake at the end of the Brule). At the end of Big Lake comes Wildcat Rapids which separates Big Lake from Lucious Lake (which is another, albeit, shorter, slog). Eventually, the current picks up as the lake narrows into a river again and stays a consistent width the rest of the way. While not overly-populated, we noticed that the landowners who are lucky enough to reside on this treasure take great care of their riverside cabins and boathouses. Of note, the cabins seemed similarly built – all quite attractive – as were the boat houses which could be perfect subjects for classic paintings and photographs of “up north”. Many were quite idyllic with red and green canoes attached to their docks (is there anything more perfect than those canoe colors? Especially when lined with wood?) just tempting guests to get in and get paddling. Past Winneboubou Landing comes some of our favorite rapids on the trip. The second set specifically, called Hall Rapids, is a fun little run under a bridge/tunnel (a hall if you will?). The slight S-curve approach and then narrow left-hand turn under the bridge makes it simply exhilarating. Just before the take-out, Little Joe Rapids, the other (rated) Class II on this section can be heard before it’s seen. It can be scouted on river-right – but we didn’t – instead opting to keep our momentum and dove headfirst into the ride. It was fun and easy, and at these levels, not evident that it was anything bigger than a Class I in relation to the others. This is one of those rapids where the bark was bigger than the bite. The take-out at Bois Brule Campground comes soon after Little Joe. It’s inviting, easily accessible and ideal by all accounts. After a great first day on the river, we headed back to Copper Range to await the arrival of the rest of our group driving up from Madison. 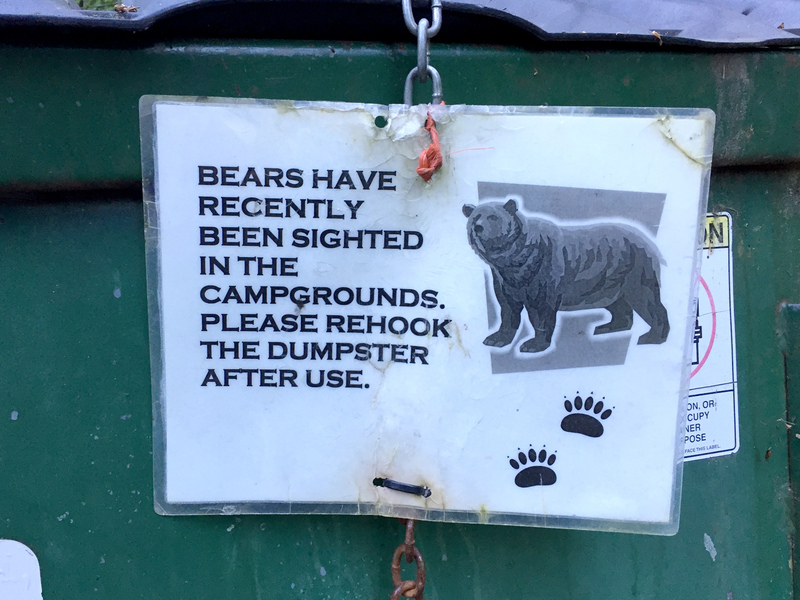 I found myself set up in a prime site near the descent to the Copper Range Landing – it was the bachelor pad of sites and probably one of the best campsites I’ve ever had (although this sign did have me on edge). The campground has pit toilets and water but not much beyond that. There was no firewood for sale but you can gather whatever scraps you can find on State Forest land and chop it up. This late in the season, much of it was picked over so we bought wood at the local outfitter (better wood) and the gas station in Brule (cheaper but not as good). Despite it being Labor Day weekend, it wasn’t all that crowded. I had asked a Ranger who had stopped by to check me in if this was one of the busier weekends. He said that though the campground stayed consistently busy, October was the busiest, due to the Steelhead run. To top off a great first day, Timothy (always the camp chef) heated up a mean jambalaya that he cooked prior to coming. It was fantastic (who has jambalaya while camping?) It was great stuff (thanks bud!) and a fine way to end the day (well, that and lots of beer). Let’s talk about privacy on the Bois. There is none. Let’s face it, eventually, everyone has to pee. But everytime I stopped to pee, (and mind you, it wasn’t very busy on the river) someone came around the corner. Not once, not twice, but three times! What are the chances? All three times I had to pee, someone was there to witness it? Sorry folks! For the first time on the Bois Brule, this section didn’t disappoint. It’s just so varied, fun and pretty. I can’t think of a better introduction to this river. Everything worked in our favor, including the two most important aspects – weather and water levels. Stone’s Bridge Landing to Bois Brule Landing is far more varied as a whole than what you can expect from the following three sections individually. The next section, for instance, is completely tame. It’s the calm before the storm though, as there’s much more fun for whitewater fans further down stream. The shuttle via bike would be taxing, to say the least. There are plenty of hills and many of the “shortcut roads” are all dirt (or mud – trust us). It’s probably best to drive or grab a shuttle from someone at one of the put-ins or take-outs. The very inviting put-in at Stone’s Bridge Landing. Without the paddler, it’s a sideways inkblot test. The Ordway boathouse marks the beginning of the historic Cedar Island estate. Close and personal with the Ordway boathouse. More scenes of the Cedar Island Estate lodging. A pretty pedestrian bridge connects the property. A unique approach to another pedestrian bridge. Approaching the narrow “Falls” rapids. Running the Falls (romantic glow courtesy of Timothy’s camera). (It took him a while to figure out how to turn it off). Sucker Lake is small and pretty. Exiting Sucker Lake and into Little Twin Rapids. Little Twin literally shoots you out into Big Lake. The beginning of Big Lake is very pretty. And it is indeed, big. The north end of Big Lake. Kicking back on the Brule. One of the many well-kept boat houses. Approaching a really cool bridge on Williamson Rapids. You may find more fishermen in this area. Hall Rapids, a very fun little run. The “hall” of Hall Rapids. The calm before the final rapids. Little Joe Rapids is an easy class II. The end of any excitement. The take-outs are all well-marked on the Brule. The take-out at Bois Brule Landing.